MARQUETTE---Northern Michigan University Men's Soccer returned to the friendly confines of the NMU Soccer field Sunday afternoon to earn a 3-2 victory over Quincy University. The victory is the second region win in as many games for the Wildcats. The first goal of the match came at the 39:02-mark after junior midfielder Edgar Astorga (Chicago, Illinois) sent the ball into the back of the net for his first goal of the season. The lone assist on the play went to sophomore forward Ben Hoffman (Petoskey, Michigan), his first of the year. It was a slow start to the match for both squads with neither team scoring in the first 30 minutes of action. Quincy controlled the ball for much of the opening 30 minutes, but the Wildcats managed a 5-2 edge in the shot category. Astorga would eventually finish the match with four points on a goal and a pair of assists. It is the most points a Wildcat has scored this season and tied for the second most in match in the program's history. 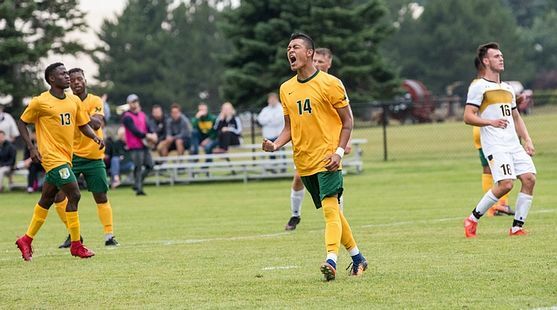 Just two minutes later, NMU increased their lead to a pair of goals with junior defender Lewis Murray (Edinburgh, Scotland) netting his first goal of the season. Astorga earned the assist for his third point of match. After a two-goal performance in the team's last match, senior forward Sam Popp (Northville, Michigan) netted his third goal of the season in the 63rd minute. The score came from just in front of the net after Astorga sent the ball into the box, picking up his second assist of the contest. After taking a 2-0 lead into the halftime intermission, the Hawks managed to trim the lead in the 62nd minute with their first goal of the match. The score cut the Wildcats lead to one, 2-1, but NMU quickly pushed the advantage back to a pair of goals. Quincy would not go down easily, scoring gain in the 75th minute of play. A deep shot from the Hawks beat the Wildcat defense to trim the lead back to a single goal. Popp's earlier goal would prove to be the difference maker as the Wildcats managed to hold on to their 3-2 lead, sealing their second region victory in as many matches. After recording a clean sheet in his first collegiate match, freshman goalkeeper Patrick Restum (Okemos, Michigan) made three saves en route to another victory on Sunday. He now has nine saves on the season to go along with a .818 save percentage and a goals against average of 1.00. The Wildcats begin Great Lakes Intercollegiate Athletic Conference action beginning Friday when they play host to Davenport University. The Panthers were the preseason pick to win the GLIAC and currently sit at 1-3-1 on the year after non-conference action.